More than a dozen medical centers across the country are currently enrolling men and women to test a new vaccine to combat the mind-robbing ravages of Alzheimer’s disease. The trial will enroll about 180 men and women aged 50 to 85 with early to moderate Alzheimer’s disease. Those who are taking medications for Alzheimer’s may be eligible provided they have been on a stable dose for at least four months. The study is what is called a Phase 2 trial, designed to test the safety and, to some extent, the effectiveness of a new drug. If the new vaccine appears to be safe and potentially useful, Phase 3 trials would follow. These are designed to test both safety and effectiveness of the new vaccine in a much larger group of people. Various vaccines and many new drugs are under development for Alzheimer’s disease. The vaccine being tested in the current trial was developed by the Elan Corporation and Wyeth Pharmaceuticals and is called AAB-001. It is aimed at beta amyloid, the sticky protein that builds up in the brains of those with Alzheimer’s disease and is thought to underlie the disease. The vaccine uses special immune system proteins called monoclonal antibodies that are injected into the bloodstream to target and remove toxic beta amyloid. A previous vaccine tested by the same companies used beta amyloid proteins to immunize patients so that they produced antibodies against beta amyloid. Various vaccines have shown promise over the years, but so far, benefits have been limited. Some vaccines that appeared promising initially could not be tested further because they produced severe reactions, such as inflammation of the brain in some patients. Researchers are hopeful that the current vaccine, which works by a different mechanism, will not cause inflammation or other severe side effects, but this remains to be determined. In addition, if it does ease symptoms, it would have to be given to the person on a regular basis, such as every few weeks. Some 20 medical centers, from Boston to Seattle, are participating in the study. To see if a medical center near you is enrolling participants and to learn more, visit the government clinical trials Web site. The Fisher Center for Alzheimer’s Research Foundation continues to fund vital research into the causes and treatments for Alzheimer’s disease. 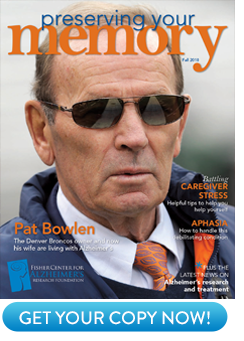 For more on vaccine and medicines currently under development for Alzheimer’s disease, visit the www.ALZinfo.org.